A team of San Diego-based nurses that was marooned in a remote mountain village following Nepal’s second major earthquake was flown out by helicopter and has resumed treating patients. Nurses Debra McQuillen and Jan Zachry, along with team leader Tim Collins, spent an extra night in the village at the 6,000-foot level following Tuesday’s magnitude-7.3 earthquake. 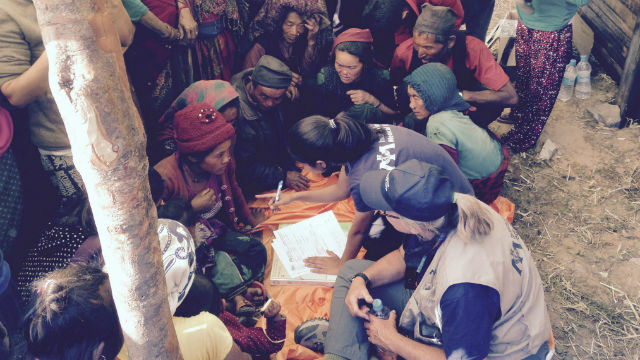 They initially went to the country to treat survivors of the magnitude-7.8 quake that struck April 25. The second temblor damaged the helicopter that was to fly them off the mountain Tuesday, so a different chopper fetched them the next day, according to Scripps Health. They, along with medical workers from other organizations, were subsequently sent to Khorla, where they treated 175 patients Friday, including a man his mid-50s who was septic and had to be evacuated by helicopter to a hospital. Another patient had a fractured arm that he had set himself after the initial earthquake. The team was able to properly re-set and splint the arm, according to Scripps. They’re in the first day of a four-day mission to reach some remote villages that are 11,500 feet high. A second team of Scripps nurses, consisting of Patty Skoglund and Steve Miller, were caring for patients in a village called Tipling. The nurses reported seeing very few earthquake injuries, but many residents have been sickened by a virus and others have chronic bronchitis, which is brought on by the practice of cooking indoors over open fires. Skoglund estimated that 70-80 percent of the buildings in Tipling have sustained some sort of damage. They plan to stay there one more day before moving on.